Patrick Roach, who worked as a postdoctoral associate at Pacific Northwest National Laboratory and is now an environmental scientist at Roach & Associates, has been awarded the 2010 M.T. Thomas Award for Outstanding Postdoctoral Achievement at EMSL. The award is presented in recognition of his "insightful and creative contributions to the development of a novel ionization method" coupled with mass spectrometry—called NanoDESI—the development of application methodology for a broad range of analytes, according to Robby Robinson, chair of the EMSL selection committee. The committee was particularly impressed with Roach's productivity associated with his work in EMSL, which includes six papers, three presentations, and a patent, he said. Roach served as a postdoctoral research associate at EMSL from 2009 to 2011, when he worked with Alex Laskin and Julia Laskin, scientists at PNNL, where EMSL is located. They nominated Roach for the award. 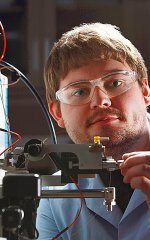 Roach received his Ph.D. in 2009, shortly before joining PNNL to work in developing EMSL's desorption electrospray ionization (DESI) mass spectrometry facility for application to study aerosol chemistry. DESI mass spectrometry bombards a sample with a jet of charged droplets that desorb and ionize analyte molecules, which are then picked up by the mass spectrometer for analysis. Shortly after arriving at PNNL, Roach invented Nanospray DESI, or NanoDESI. His technique improved the speed and spatial resolution of DESI by adding a second capillary that turns molecules dissolved in the deposited liquid into ions by nano-electrospray ionization. Roach's modification requires very little sample—10 nanograms—to complete analysis. NanoDESI enables researchers to collect a high-quality signal in less time, making the analysis highly functional and very sensitive. After inventing nanoDESI, Roach focused on developing and demonstrating the technique and data analysis techniques on a range of samples including petroleum, blood plasma, microbial communities, and biological tissues. He was the lead author for a paper featured on the cover of Analysis and also presented his findings at the American Society for Mass Spectrometry, PacifiChem and the American Society for Mass Spectrometry Asilomar meetings. As a demonstration of the importance of his discovery, the technique has been used by other researchers for a range of different analyses. Many long-term users at EMSL applied NanoDESI in sensitive analyses of laboratory-generated as well as field-collected aerosol samples. Additionally, NanoDESI imaging techniques have attracted new EMSL users.